Unlike most medical dramas that feature doctors as the main characters, tvN’s new series “A Poem, a Day” depicts staff who are less often in the spotlight. The new Monday-Tuesday drama centers on the lives of physical therapists and radiology technicians, dubbing them “co-medical staff.” It can also be called a “comedical drama,” as it features a combination of comedy and medicine. Producer Han Sang-jae hopes to set the series apart from other medical dramas by not featuring doctors as the lead characters. “Watching medical dramas, I always wondered why they only depicted the lives of doctors, while there are so many other staff members,” producer Han said at a press conference held Tuesday in western Seoul. He added that there are many stories to be told of the other staff who work hard for patients. “Compared with the doctors, ‘co-medical staff are much closer to patients. While doctors meet patients for just five minutes, physical therapists spend around an hour with them,” Han said. As it can be gleaned from the title, the 16 episodes all feature poems. “After watching the drama, viewers will feel as if they’ve read a book of poetry,” the producer said. 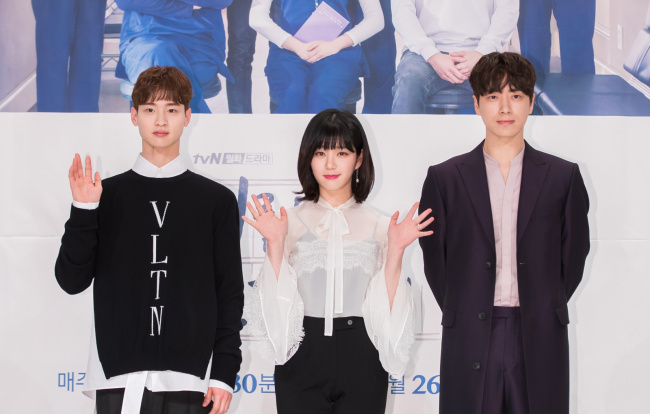 According to the producer, poetry is used to deliver the story more effectively and to explain the relationships between the main characters, played by Lee Yoo-bi, Lee Joon-hyuk and Jang Dong-yoon. Actress Lee Yoo-bi, who has shown her liking for poetry through social media, plays the role of a physical therapist who is into poetry. Her character often sheds tears after reading a poem. Although the drama portrays the lives of the staff using poetry, the actress stressed that the overall story is not too serious. She was cast for having a comical aspect to her acting. “A Poem, a Day” airs Mondays and Tuesdays at 9:30 p.m. on tvN.